The people in the picture above are the happiest people I have ever met. 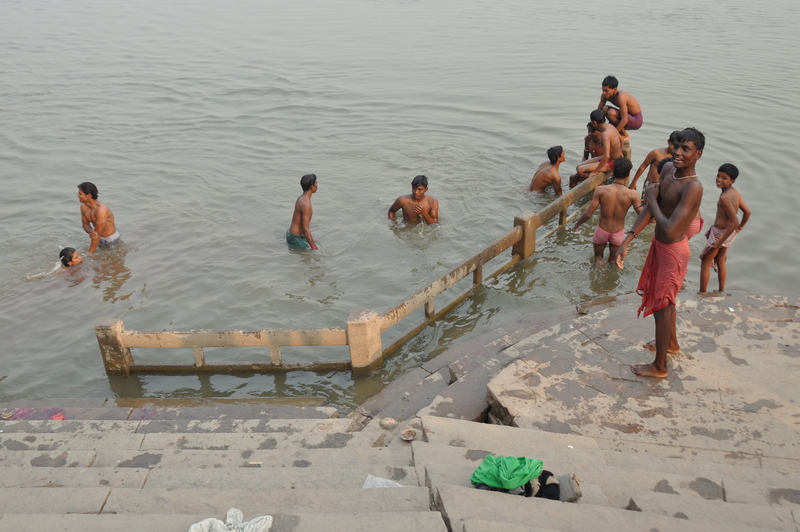 As they descend the steps into the River Ganges to bathe, they purify their souls. For many of them, this is part one of a spiritual journey that only the most devout among us will ever make. 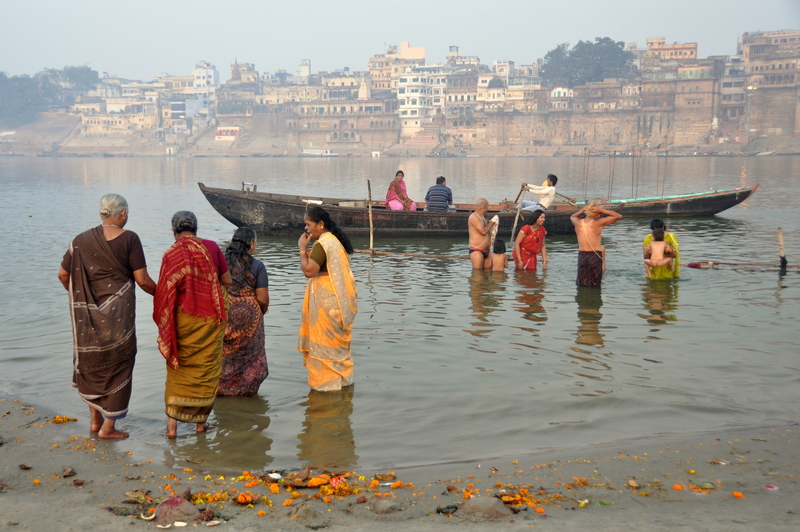 Bathing in “Mama Ganga” cleanses the Hindu soul. 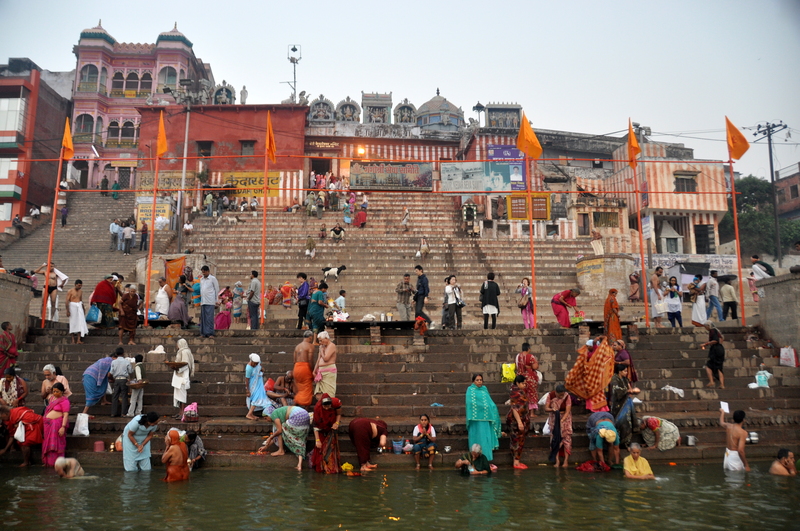 Many of the people wading into the river from the sandbar above are elderly, and it is said that the holy waters possess healing qualities to them. But there is more. For most of us, life ends and we leave our physical bodies behind. 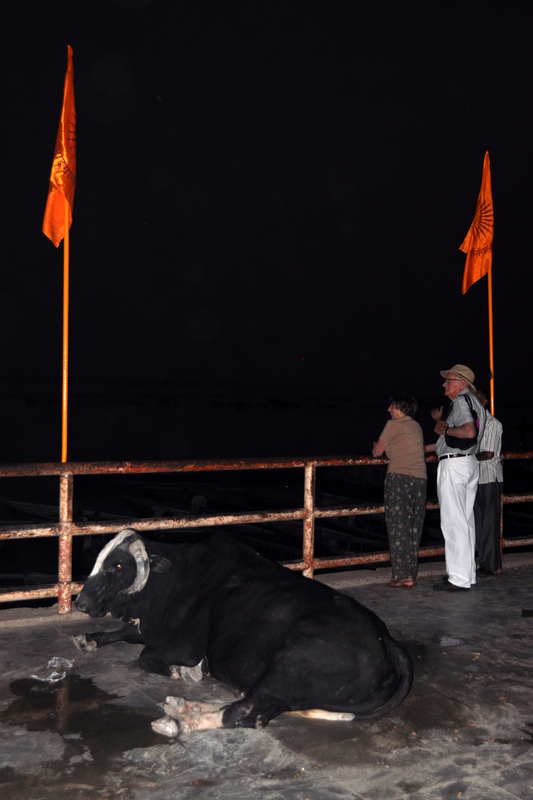 For Hindus, however, once they pass on, their spirit is reincarnated in another body to repeat the journey ad nauseum. 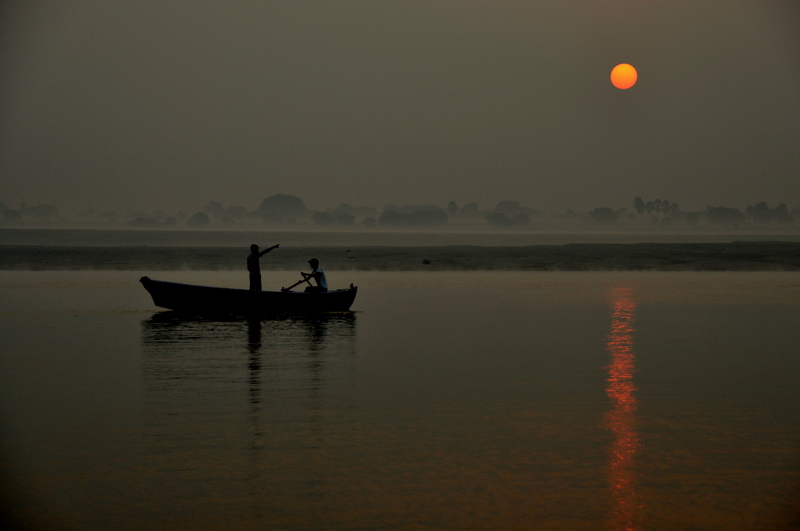 It would seem that there is only so much life-after-life suffering one can endure, and it is believed that cremation on the banks of the River Ganges brings an end to the exhausting cycle of reincarnation. 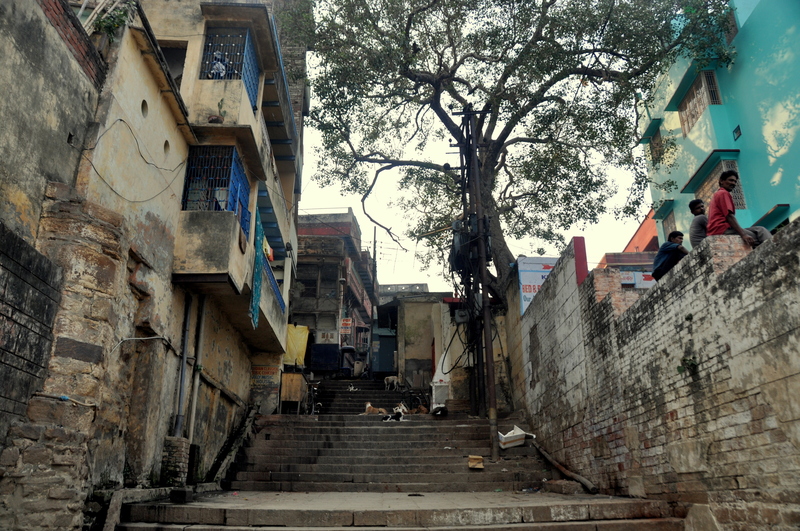 As you stroll along the eastern bank of river, towards the northern and southern ends of the city you will find burning ghats, literal funerary pyres with bodies being burned. Out of respect, I didn’t take any photos of the cremations. 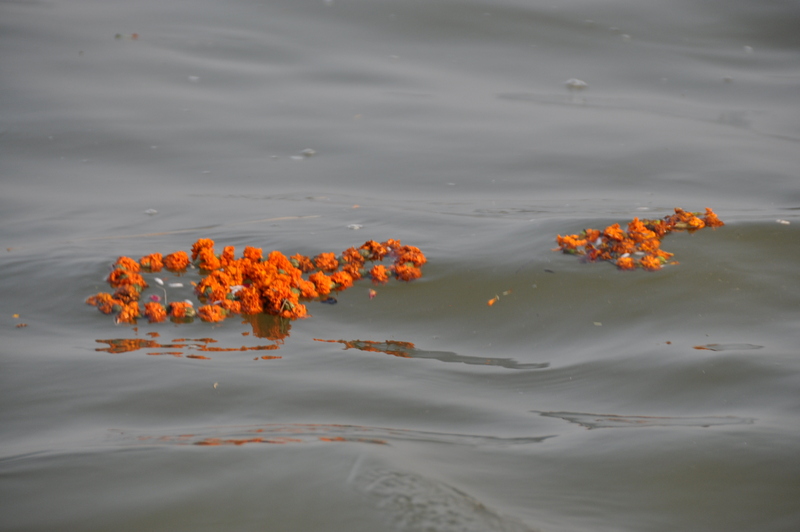 I found the image of the marigold leis in the photo above to be equally evocative of the notion. …and once before sunrise. Make no mistake: although my shutter was snapping seemingly a hundred photos a minute, my restless traveler’s soul had found peace. 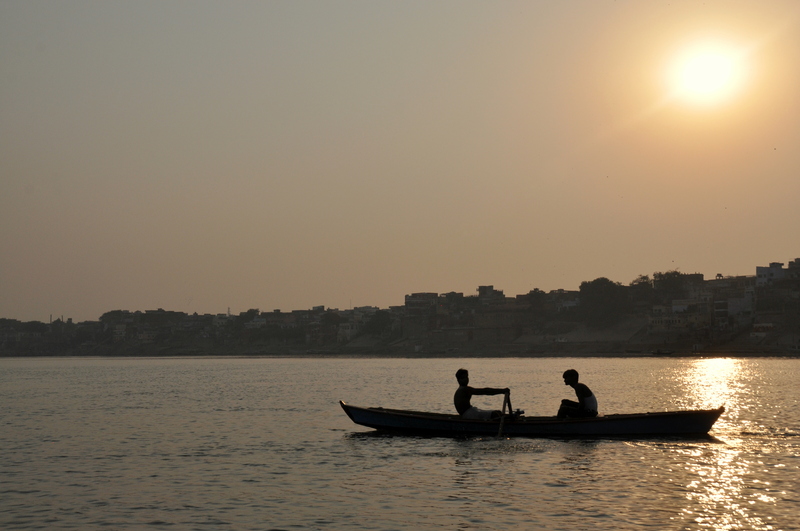 There is something to be said about such tranquility, something that, alas, isn’t always easy to find in urban India. 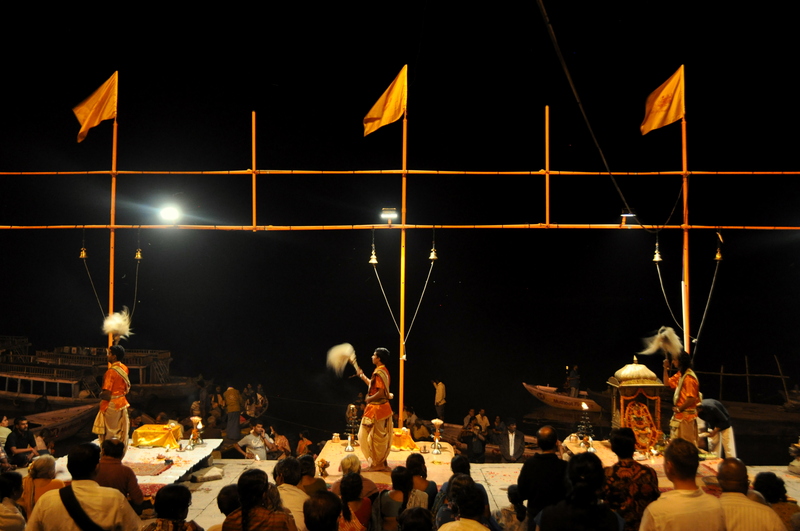 Most nights, a trio of Hindu priests perform a ritual, Ganga Seva Nidhi, presumably in honor of Mama Ganga. 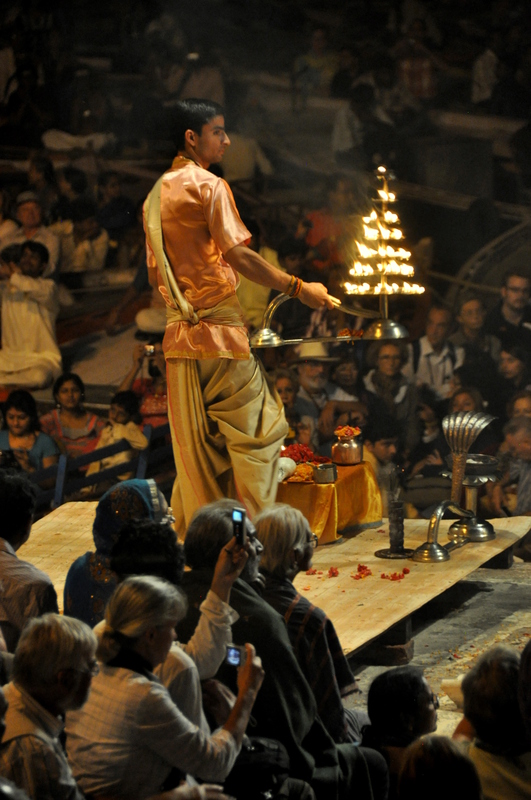 Although I didn’t understand much of what I saw, it included an offering of candles, and it brought locals and visitors to the largest ghat in big numbers. Volunteers served rice and lentils to the less fortunate, and I observed several people offering all or part of their meals to the few cows that joined the crowd. Notice the people in the background. 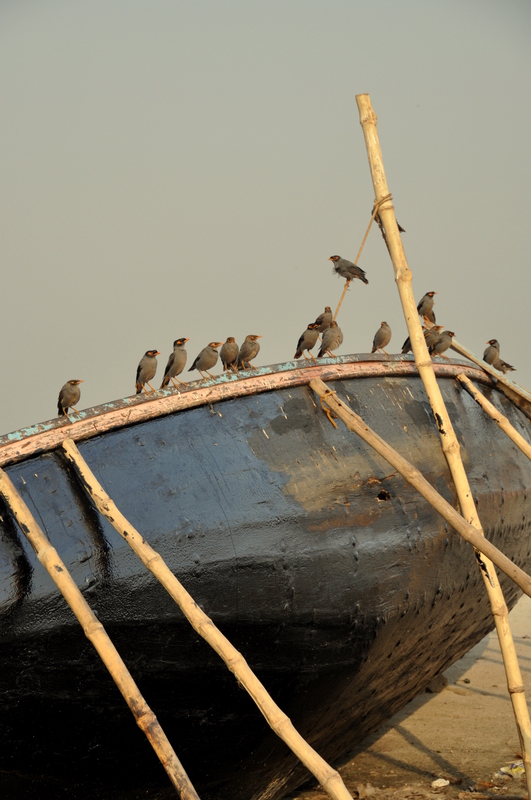 They are enjoying the religious ceremony from boats on the river herself. The candles floated away and the crowds left at show’s end, but some lingered to soak up the ambiance. 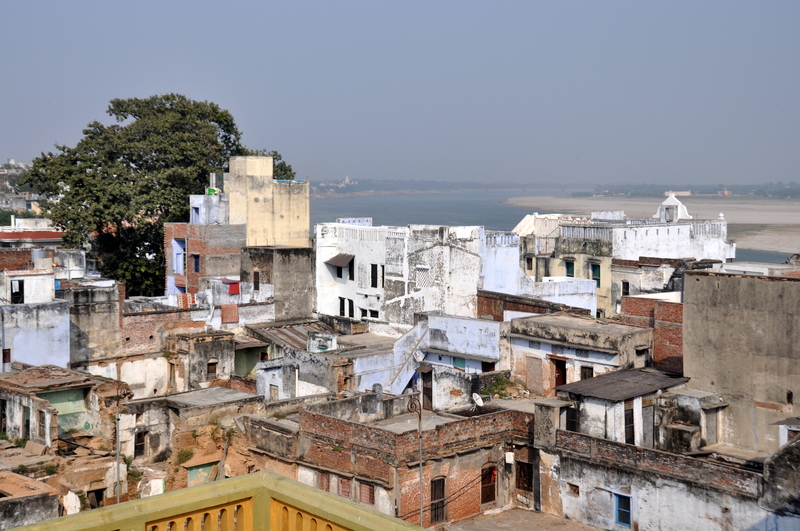 …and ramshackle apartments rising up on either side of ghats leading to the river’s edge. 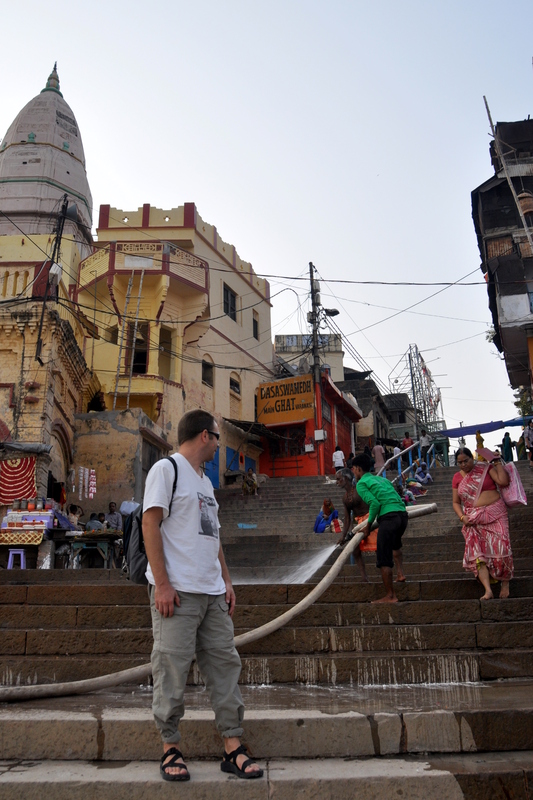 You won’t see any cars or taxis around the ghats, but once you reach the top of the stairs Varanasi starts to look like any other Indian city…complete with the occasional bovine photo bomb! 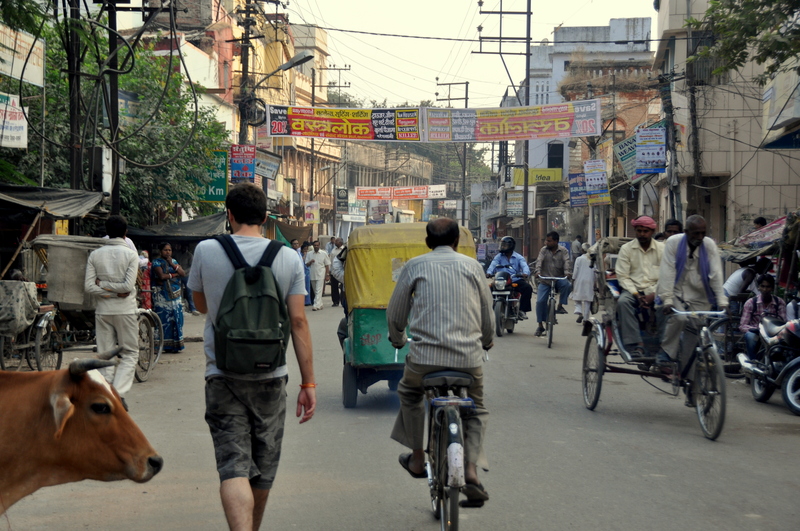 I stayed at the Ram Bhawan Kautilya Society, a non-profit hostel of sorts for open-minded travelers. I will never forget the succulent vegetarian lunches served there (the healthiest I have ever eaten in my life), nor the views from the hostel’s rooftop terrace, as pictured above. 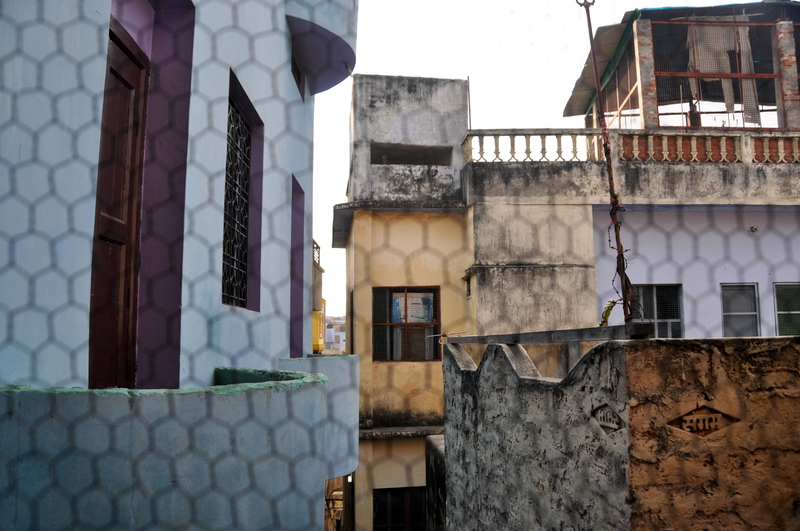 Rooms had chicken wire nailed tightly to the windows. When I asked why (after all, chicken wire won’t keep mosquitoes at bay), I was told that it was to keep free-roaming monkeys out of the rooms! 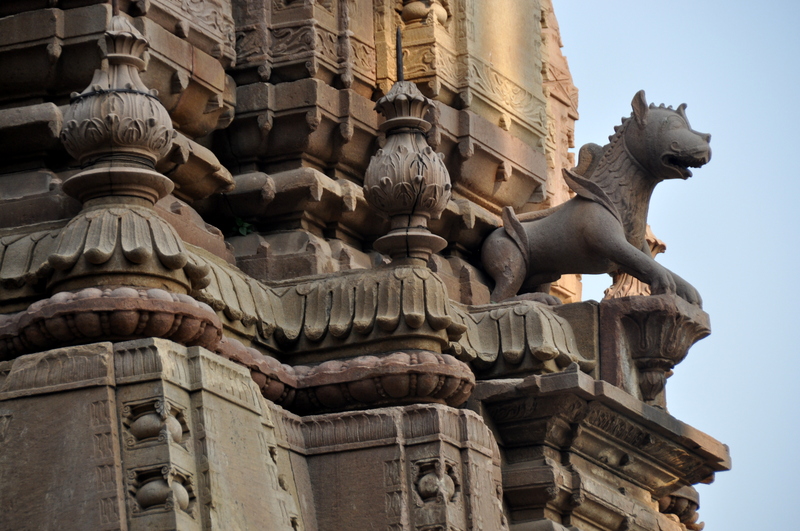 The children of Varanasi possess a beauty and innocence that I seldom see. Sad, though, that the plastic lily pad candle vendor in the picture above is so young. I gave her a few rupees in exchange for her picture; was I perpetuating a vicious circle of poverty or did the money help? Still, despite the poverty and the funerary pyres, I found the people of Varanasi to be among the happiest I’ve ever encountered. There is nary a sad face among the boys frolicking in the picture above, never mind the fact that bodies are being burned just upriver of where they are swimming. If you are a regular reader of this blog, you may notice that my writing isn’t “on point” with some of my better work. 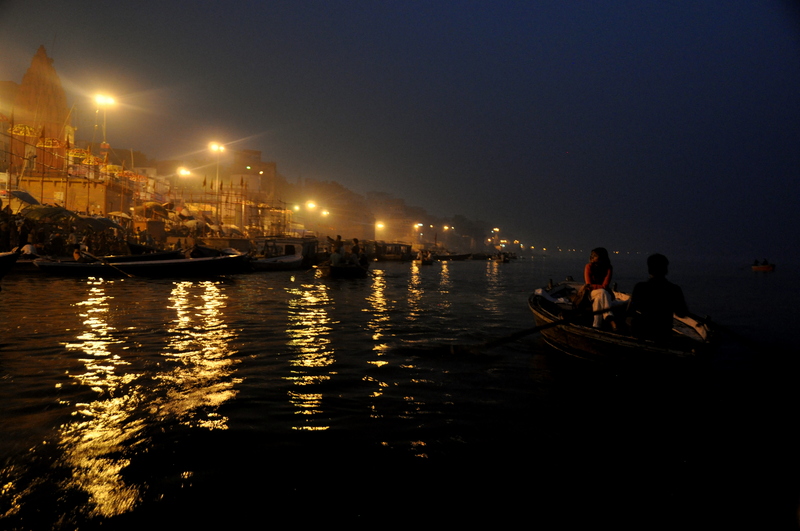 That is no doubt in part because I simply can’t find the words to describe my memories of Varanasi. I mean, what would you say about the photo above? Several years ago, I decided that upon my death, I want my body to be cremated and my ashes scattered from the summit of Sandstone Peak, the highest mountain in the Santa Monica Mountains. 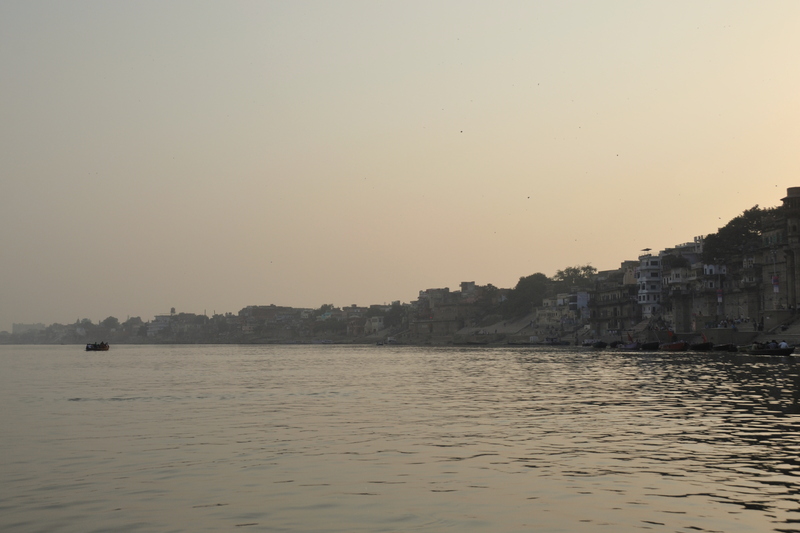 Rethinking the subject as I write this, having my remains sent to Varanasi and burned on the banks of Mama Ganga seems an equally fitting way to return to the earth. Namaste.